Having tinted windows on your vehicle is a practical choice, as it will help to keep your vehicle cooler, help hold the glass together in an accident, and will help reduce glare. Tinted windows also offer an air of sophistication. But drivers in Connecticut need to be aware of the state’s window tinting laws, which are designed with safety in mind. Window tinting laws in CT provide that you may tint the front and rear windows on both the driver’s and passenger’s side. CT drivers may not tint the entire front windshield; it can only be tinted from the top of the window to a point that is at least 29 inches above the top of the driver’s seat. If you drive a multipurpose vehicle (MPV) such as certain trucks, SUVs or busses, trailers or motor homes, the windows to the rear of the driver can actually be tinted darker than the others if the vehicle has rear view mirrors on each side. However, this is not automatic; the manufacturer’s label has to identify your vehicle as an MPV to qualify for this exception. Connecticut‘s window tint laws also provide an exception for drivers with certain medical conditions. So while drivers without the exception must have tinting that lets in at least 35% of the light from outside, persons with a medical exception can qualify for tinting that lets in between 20% – 32% of the outside light. If you think you qualify for the medical exception, you’ll have to request and complete an application provided by the CT DMV. If the DMV grants your request for exemption, the vehicle will have to be tested and the tint measured at either the Wethersfield or Hamden DMV inspection lanes. If the vehicle passes the tint inspection, the DMV will validate a form which must be carried in the vehicle at all times instead of using the compliance sticker described above. However, vehicles that have a light transmittance of less than 20% will not be automatically exempted. Connecticut‘s window tinting laws are designed to keep everyone safer on the roadways. By being aware of the requirements, you can make an informed decision about tinting your windows. I just bought a used car and I’m looking into tinting the windows to be a little bit more darker. The information you provided was helpful since I want to make sure I obey all laws in relation to window tinting. I didn’t know that you can get a medical exception when it comes to window tinting. I’ll remember this when I got to an auto detailer. Thank you Alice for your feedback and I’m happy the information provided was helpful to you. Sealing the paint is an important part of owning and protecting your investment. 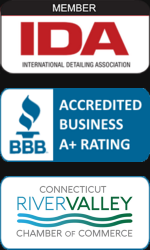 If you would like more information about this process please visit our website exterior detailing . Also in many states you can get a medical exemption from your primary doctor or eye doctor to go beyond the states legal limit. Always ask or do your research about car tint law. Auto professionals will most likely be familiar with laws concerning tinting car windows in their area. I was stopped for my tints, I drive a Honda civic lx 2 door, I removed my front tints and don’t know whether I need to remove my back Windows too, I know the rear windshield I don’t, I mean the two non door windows.